All I could think of while riding today was which truck that ornery driver from the ferry was behind the wheel of. Well, that and also I was thinking of not riding because I still felt tired. It seemed like we rolled a lot of miles out on busy highways, ending with a construction zone. 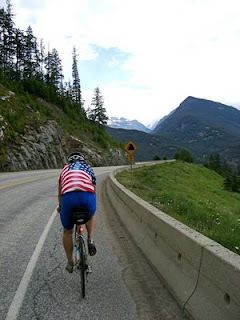 But there was also a very nice stretch along Slocan Lake which climbed for 6 miles and ended at an overlook where we had lunch and then a descent that intersected a rainstorm. A lot of variety! A glimmer of something caught my eye when I rolled into New Denver and I went to go check it out. 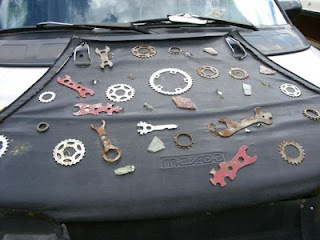 The van said "Bicycle Doctor" on the side of it and it had bicycle parts ornamenting its hood and bicycles and wheels stuffed inside of it. 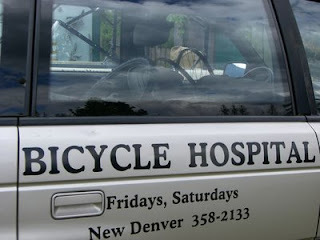 I took a look around the house that the car was next to and saw more "Bicycle Hospital" vehicles. 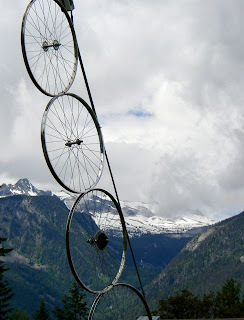 Then I looked up and, upon noticing the gorgeous mountain view, saw that bicycle wheels led straight up to the sky- check out the photo! What saved the day from being just another grind in the saddle, aside from Slocan Lake and New Denver, was the Kettle Valley Road that we turned off onto for the last bit before arriving in Castlegar. Rolling hills, an old bloke on a bicycle, a helicopter perched in a tree (not making this up) and HB taking photos from the SAG, with Tom S also making movies from the saddle. Sylvia, in the SAG at the outskirts of town, teased us with just a few miles to go. "you're almost there", she said confidently, until we had to climb another hill and pedal a few more miles. When I arrived at the hotel, I was done. I checked in, grabbed my bag and made my way upstairs. I slid my card key in the slot one way, then another, then I gave in to my fatigue and crumpled outside my door, landing crooked but gracefully, I'm sure. I was confident that eventually someone would come and probably help me and I was right, as a figure soon loomed above me. Luckily, it was Jay and not some random guest staying at the hotel. He opened my door, scooped me up and wished me well. Rest up, tomorrow is a day full of climbing to the sky.